The plan was do to a Paisano Burgundy link up, but nothing that day quite went according to plan. Andrew, Tim, James and I slept at the trailhead 4mi east of WA pass, and were walking by 5:45 Saturday morning. The trail starts by scrambling down past cairns to Early Winters Creek, then weaving up through the woods to the bivy camp. The camp is roomy and has excellent views of the Liberty Bell group – next time I’ll block a few more days and plan to stay here. The trail up the spires is steep, and at times the footing is poor on marbly rocks. It is relatively easy to follow with regular cairns. As we approached the base of Paisano around 8, it became clear that we would have to wait for a few other parties to climb before our two parties of two could jump on. Weighing our priorities for the day and recognizing that a delay may mean we couldn’t complete the link up, we decided to push on to Burgundy. We scrambled up to Burgundy Col at 7720’, roughly 3600’ above Early Winters Creek. At the col we left our bags, and started scrambling to the base of the climb. 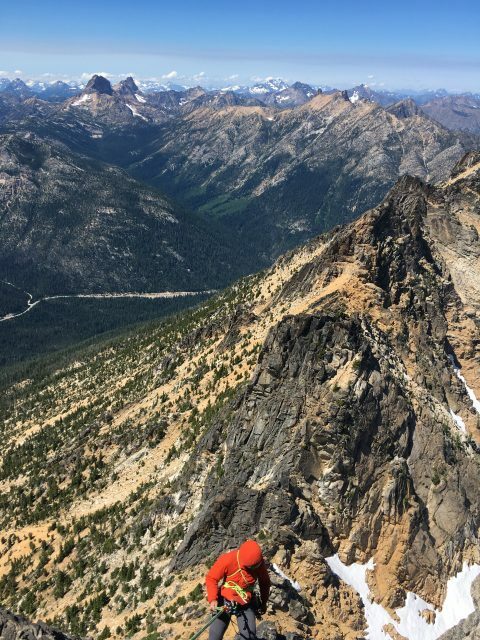 We had planned on climbing the original route that heads directly up the north face of the spire. However we struggled significantly with route finding, and ultimately opted for what now seems to be the most popular route. This option traverses right at the top of pitch two. If I described the climb how we did it, it would be a messy and confusing string of climbing, rappelling, traversing, and so on. I will instead pitch it out how I would climb the North Face of Burgundy if I were to do it again. Traverse right 50m, under a large block, to a long ledge to start the third pitch. P5. Trend left, stepping around a bulge into a tapering left facing crack. A move or two of offwidth then good hands higher up, and a slightly overhanging jug to pull onto the ridge. 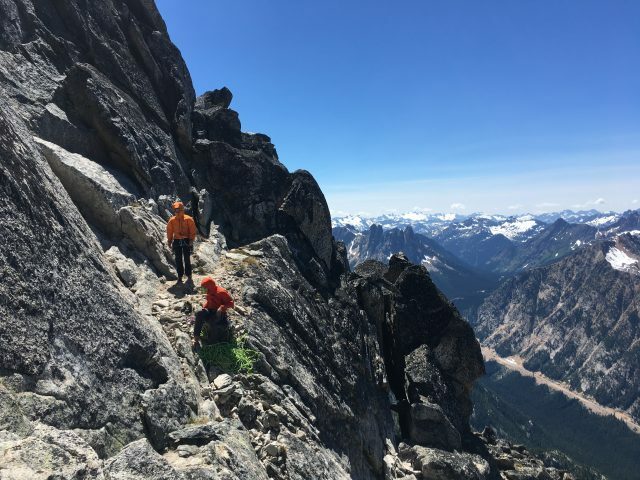 Belay from the ridge to avoid rope drag, then scramble left to the summit. Descent: Two 60m ropes made for a relatively quick decent. We doubled up to rappel climbers left of our route to the next station. 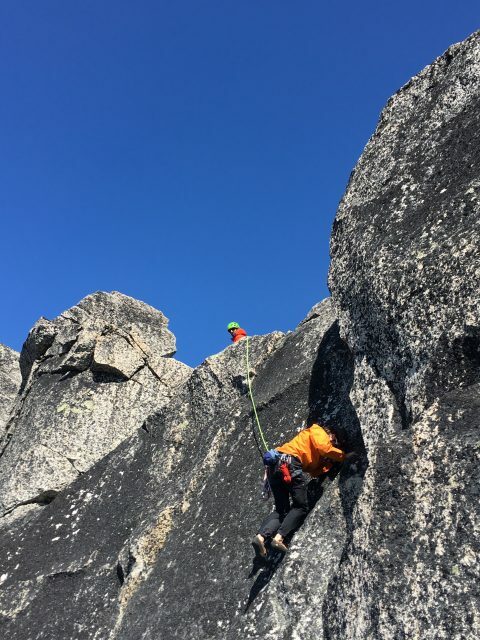 Another single rappel brought us to the ledge at the bottom of the third pitch. 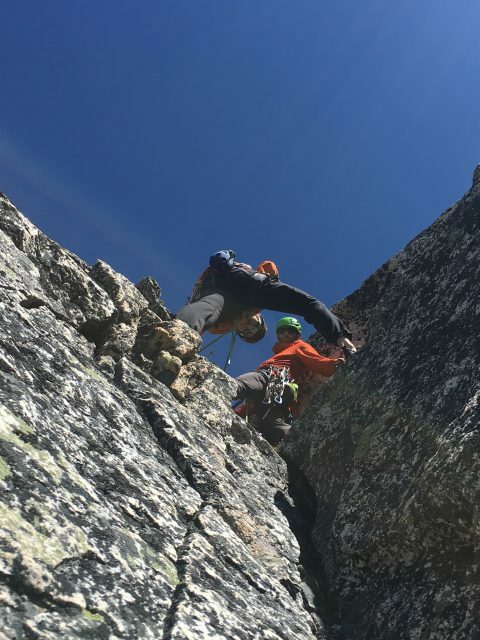 Rather than following our ascent path, we cut left down to a rappel station just after walking back under the large block. Three more double rappels brought us back to the col.